The Fullwood report commences with reference to the requirement to comply with PPS12. This policy is sub-titled: Creating strong safe and prosperous communities through Local Spatial Planning. Throughout PPS12 it is specified that planning documents should be based and proved to be based on “a robust and credible evidence base”. PPS4, page 5, states that planning authorities should: “.a).. Prepare and maintain a robust evidence base to understand both existing business needs and likely changes in the market…… b) ensure that the volume and detail of the evidence they gather is proportionate to the importance of the issue.”. Faversham Creek is identified as a key regeneration site, being specifically identified as such in the Core Stategy. Thus the volume of evidence of existing business needs, most crucially those operating in accordance with the wider vision of a revitalised, working creek, should be substantial. However, the Fullwood Report contains no evidence of the pre-existence of a successful regeneration of Standard Quay. It fails to acknowledge the factors which enabled this regeneration to occur and acknowledges only the imagined business needs of a future, and different, business model. The retention and improvement of wharfs and mooring posts for large traditional craft repair at Standard Quay. Improvement of the wharfs at Standard Quay specifically designed to render them perfectly suitable for large traditional boat repair has been an ongoing project for 18 years. The large traditional vessels at the Quay rely on the mooring rings secured in concrete, attached to subterranean chains and set back from the quay edge. This provides a far more secure mooring than posts. The provision of workshop space including for apprenticeships at Standard Quay. Use and employment in crafts and activities directly related to the Creek and the building, maintenance, restoration and mooring of traditional large vessels has been established in all of the workshops at Standard Quay. A significant investment had been made to provide a fully fitted workshop for the Apprenticeship scheme, which was set up and was expanding for a year prior to the commissioning of the Fullwood Report. The restoration of listed and important historic buildings ( some of which are at risk) and enhancement of their setting. 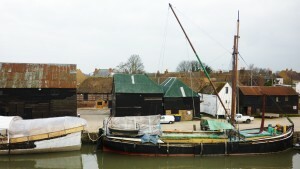 The group of simple, black tarred, weather-boarded sheds on Standard Quay are listed because of their grouping as simple artisan working buildings associated both with the adjacent Monk’s Granary and the working tidal Creek. While leased by Standard Quay (Faversham) Ltd, hey have been maintained in a manner totally in sympathy with this ethos and are used in accordance with their long history as stores and workshops. Further, their full use for the skills associated with the large traditional vessels that the facilities here attract, enhance their setting to a degree which surely could not be bettered. This evidence is ignored in the Fullwood report. A greater diversity of uses and attractions for tourists and residents alike with increased vitality during day and evening. It is not clear what exactly is meant by improved vitality. Given the provision elsewhere in the report for the buildings at Standard Quay to have their use altered to restaurants, the assumption must be that this is what is perceived as potential evening vitality. This ignores the fact that, to operate as a boatyard, it is necessary to work evening tides. Adding such uses as restaurants will create the kind of vitality seen everywhere else but will destroy that which is unique to a tidal creek. Improved signage from the town centre and provision of a creekside public footpath which forms part of a circular heritage trail and improves connection to the long distance public footpath network. While improved and appropriate signage indicating the historic significance of Standard Quay to the town would be appropriate, there is no evidence presented in the Fullwood Report of the fact that Standard Quay has over the past 18 years been wholly accessible to the public without restriction and without the limitations of a demarcated footpath. Members of the public are free to view the vessels as they walk along the creek and are also free to view the buildings. This access is already linked in to the long distance footpath network. Providing a demarcated footpath here would therefore reduce, and not increase, the public access that is available at present without adding anything at all to access to the long distance network. The Fullwood Report appears to suggest that such access does not yet exist. It has existed unobstructed at Standard Quay for many years. A Faversham Creek Regeneration Fund. The implicit assumption that regeneration must be funded by development ignores the evidence that Standard Quay was regenerated over the past 18 years with no recourse to public funds. It has been self financing and has provided a steadily increasing level of skilled local employment in a sustainable and expanding local traditional industry. There is no mention of this in the Fullwood Report. By ignoring evidence of pre-existing regeneration, contrary to the guidelines in PPS4 and the requirements of PPS12, the Fullwood Report suggests policies which ignore and damage existing business needs and so not only fails to establish policies to create a strong safe and prosperous community, but in fact, recommends policies which would damage such a community already established at Standard Quay. Had the Fullwood Report fully acknowledged the employment, skills training, tourism activities and heritage preservation taking place at Standard Quay, the conclusion that a Compulsory Acquisition of the site was in order would have been inescapable. Other evidence which is ignored by Fullwood is the wholly unique setting of Standard Quay in particular for traditional boat repair, maintenance, mooring and building. 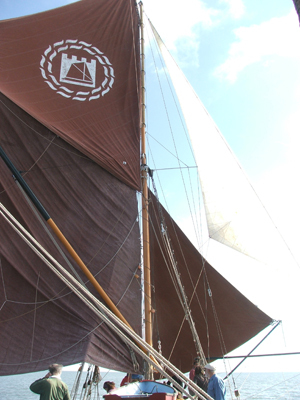 The proximity to both theThamesandMedwayRivers, both of which are home to sailing barges and other large traditional craft in need of facilities for restoration. Such flat bottomed river craft are confined largely to estuarine waters and cannot reasonably travel further afield. The winding, inland nature of Faversham Creek and its culmination in the Town is a perfect muddy haven for these craft to winter and be repaired. Faversham Creek is important, for example for the activities of the summer charter work done by SB Greta out ofWhitstableHarbour. SB Greta spends the winter at Standard Quay and uses the Quay as a haven in foul weather.WhitstableHarbouris unsuitable for barges in foul weather. The tidal range at Standard Quay is perfect for boat building. Not too big, not too small this tidal range means that materials can be safely carried aboard at all states of the tide and that vessels can arrive and leave on every tide. 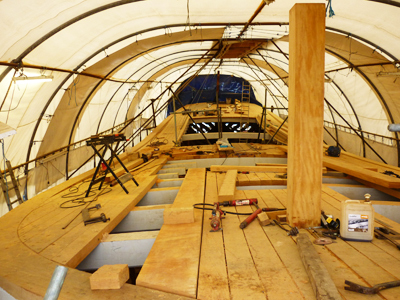 The tradition of boat repair built up here over centuries has resulted in a large local base of skilled labour. A lull in boat activity in the Creek over the past few decades (now reversed) means that this skilled labour pool is aging. It is vital that training is carried out to continue these essential skills into the future. This was established at Standard Quay, but is endangered by the policies of the Fullwood Report. The conclusion to the Fullwood Report that “the recommendations in this report are likely to stimulate regeneration without the need for compulsory purchase” has been reached only because the evidence we provide here is over-looked. The emphasis is entirely upon landowner interest and not in the interests of Creek users and the Town in general. The recommendations within the report will close down the current activities at Standard Quay and replace them with non-marine specific activities such as restaurants and shops. This increases the potential rental value of the land and will displace the skilled activities which have been built up so successfully over 18 years using the Creek, its tidal-flooding muddy nature and local skilled labour. These factors which contributed to the establishment and success of the Quay for its traditional purpose of ship-building, repair, mooring and maintenance are seen as constraints to be overcome for the establishment of land based activities such as restaurants and shops. – Changing the SFRA from functional flood plain, maritime only use to 3ai to allow shops and restaurants. – Allowing additional uses within the simple weatherboarded buildings which will not only exclude their current, flexible use by maritime craftsmen, but will irrevocably alter their nature and separate them from their working association with the Creek. – “providing” a public footpath. There is already free and unrestricted public access. – concluding that activities on the Creek must be funded by allowing housing or other non-maritime uses along the banks which will, inevitably, displace marine activity. Please add my name to the long list of supporters for retaining the maritime activities at Standard Quay. I find it difficult to comprehend how such a report (Fullwood) can command any respect or be takenseriously.